MACAO – Nov 13, 2018 – The multi-award-winning Conrad Macao, Cotai Central is presenting a range of celebratory and sophisticated festive offerings for guests this season. From the sparkling Christmas decorations gracing the hotel lobby, to the finest dining, takeaway roasts, exquisite afternoon teas and indulgent spa sessions, there is something for everyone to enjoy. Grand Orbit has specially prepared delicious international lunch and dinner buffets that will take guests on a culinary journey around the globe this holiday season, including Western, Chinese, Japanese, Portuguese, Southeast Asian and Indian specialties, along with chilled fresh seafood. Christmas Eve and Day dinner buffets offer a pan-fried Boston lobster station, alongside deep-fried soft shell crab, oysters Rockefeller, Thai style grilled Iberico pork, lamb rack with mustard jus, pan-fried salmon fillet with herb tomato salsa and baked new potatoes with truffle cheese sauce. Diners will be delighted to find carving stations for classic seasonal fare including roast turkey with all the trimmings, honey-baked whole pineapple ham with apple sauce, braised chestnuts and roasted sweet potatoes with cashew nuts and roasted prime beef rib. There is also an Italian station for pizza, risotto and pasta, a Beijing duck station, a pan-fried foie gras station and Indian and Southern Chinese stations. The Christmas Day lunch buffet adds a pan-fried prawn station, seabass fillets and baked scallop thermidor, while New Year’s Eve Dinner offers a roasted lamb rack carving station. Those with a sweet tooth will love the dessert buffet which includes a red chocolate fountain alongside Christmas favourites such as mince pies, buche de noel, festive brownies, Christmas cake, Christmas cookies, pralines, gingerbread men and candy lollipops. The Lounge, at Conrad Macao will be serving a mouth-watering Premium Christmas Tea Set from Dec. 1-31, 2018, featuring savoury snacks and sweet delights, along with a choice of tea or coffee or two Christmas cocktails/mocktails. For a truly decadent experience, enjoy a Deluxe Afternoon Tea menu which includes an exclusive, limited edition Christmas Conrad Bear. The festive period can be a demanding time, and for busy hosts, Conrad Macao is here for you! Whether looking for classic roast feasts with all the trimmings, snacks or desserts to take away for your Christmas celebrations, there are plenty of delicious options for your convenience. From Nov. 17, 2018 until Jan. 2, 2019, various takeaway packages are available at Grand Orbit. Select from single items including succulent U.S. butterball turkey, whole chicken, pineapple and honey-glazed ham, bone-in lamb leg and U.S. Black Angus beef striploin, or packages with mashed potatoes, honey-roasted pumpkin, sautéed green beans with pancetta and a sauce. For a party of 12 to 16 people, the Takeaway Package set also includes Margherita pizza, ham and pineapple pizza, chilli seafood pizza, garden salad, canapés and a choice of turkey or roasted Australian beef striploin, traditional chocolate log cake, assorted cookies and two bottles of juice. Please call +853 8113 8910 or email macau.grandorbit.reservation@conradhotels.com for details or to place an order. • Muscle Rejuvenation Oil: For aching muscles. Contains lemongrass, black pepper and rosemary. • Dreamtime Oil: For deep, restful sleep. Contains chamomile, lavender and mandarin. • Wellness Purifying Oil: For positive energy and detoxification. Contains juniper, grapefruit and fennel. Meanwhile the Let It Glow package includes a choice of 90-minute massage, a 30-minute refresher facial and free limited edition holiday gift – a Karuna Holiday Let it Glow Sheet Mask Collection, worth over MOP 624. The package is priced at MOP 1,825*** (usual price MOP 2,500***) and is available Nov. 12 – Dec. 31. For more winter treatment and spa options and to make a reservation, contact Bodhi Spa at +853 8113 6188. Advance bookings are recommended. The season would of course not be complete without our bespoke Christmas edition Green Tartan Conrad Bears and Ducks. These limited edition collectibles are waiting for you to bring them home from The Gift Shop from Dec. 23, and are also provided on a complimentary basis to guests staying at the hotel on Christmas Eve and Christmas Day nights. Located in the heart of Sands Cotai Central, Conrad Macao, Cotai Central offers luxurious accommodation, international restaurants and more than 200 luxury designer and lifestyle stores for guests who want to enjoy retail therapy during the festive season. To stay up to date with Conrad Macao during the holidays, follow us on facebook.com/conradmacao and instagram.com/conradmacao or visit Conrad Macao, Cotai Central website. 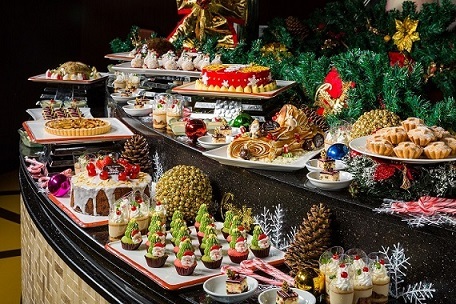 Photo caption: Conrad Macao’s Grand Orbit is offering a wide range of festive desserts for guests this Christmas and New Year’s Eve. Photo caption: Guests can indulge in a Winter Warming Massage and Take Home Package at Bodhi Spa, which combines a massage with a limited edition Five Senses Organic homecare product. Photo caption: The festive season would not be complete without limited edition Green Tartan Conrad Bears and Ducks, available from The Gift Shop from Dec. 23.